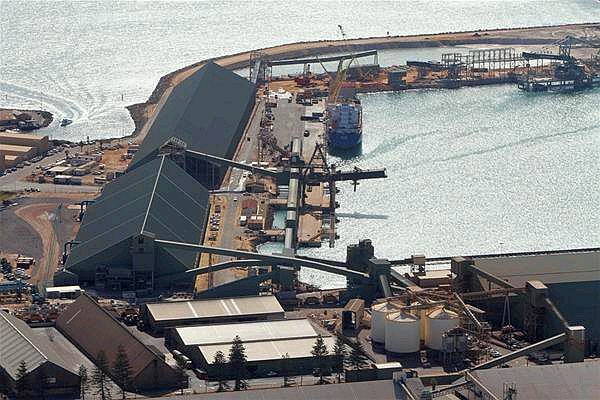 Our customer manages the bulk handling for a range of materials including iron ores, grains, fuels, metals, mineral sands, talc, garnet and fertilisers. Trade growth has seen their output move from a five million tonne per annum facility five years ago to comfortably reach 10 million tonnes in 2013, with further projections that the facility will handle up to fifteen million tonnes by the end of 2014. Our customer was experiencing 2 key problems; the primary problem was potential mechanical failure due to excessive load. The second problem was to reduce material spillage. At the key loading zone area, the original trough support frames were beginning to fatigue, in part accelerated due to the increased output, but also the trough frames were not suitable for the types of heavy loads that our customer manages. The existing trough supports required an increasing amount of maintenance and they were creating significant levels of material spillage that had to be cleared manually on a daily basis. After research and then consultation with our Sales Engineer, our customer decided to install the K-Shield Impact Belt Support Systemg to meet the needs of the Facility’s heavy duty and increased material handling projections. They used this opportunity to request some modifications. The customer’s first modification idea was the creation of quick release pins for ease of installation and ongoing maintenance. The second modification was a joint idea between customer and Kinder Australia. This was the addition of holes in the side supports to enable a chain or sling to help retract the side for ongoing maintenance. Our ISO 9001 certified design and development process meant that the specification and manufacturing phase of this idea went smoothly and without error. Our customer is delighted with the final outcome.